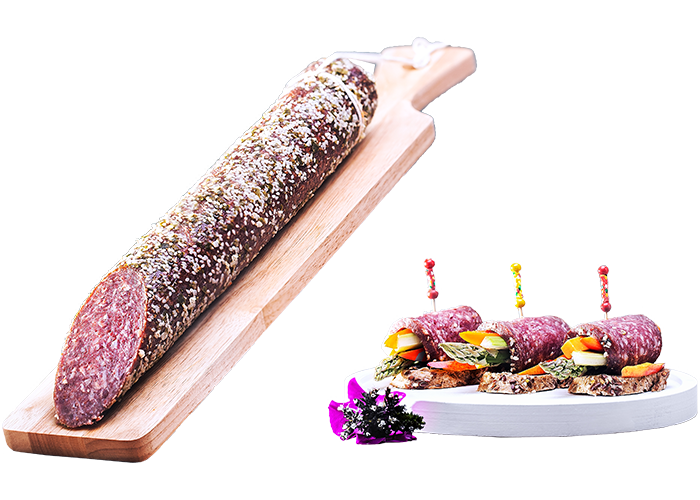 Taste the wild side of savors, with our flamboyant selection of finest HoReCa Salami. 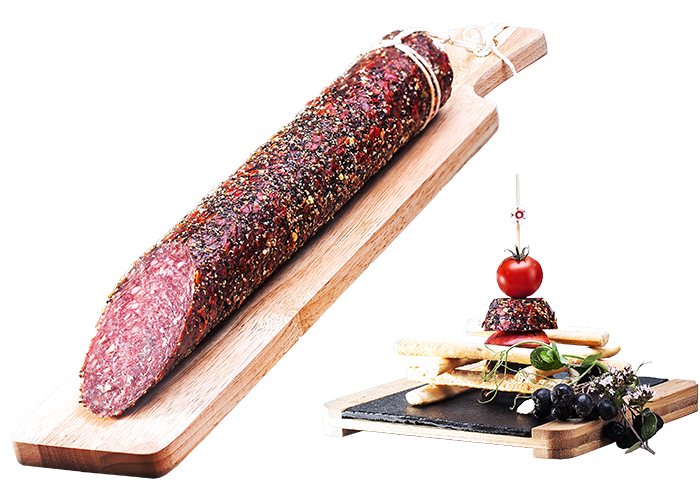 Dried, smoked and pampered with pepper, coriander, chili and mustard seeds, it’s a sheer delight for any traveler. Our specialties are based on traditional recipes, combining the best mature meat with the highest knowledge in the fine art of cuisine. Cut some thin slices, place it on a wooden plate next to a glass of dry red wine, and you’ll have the very definition of pleasure! 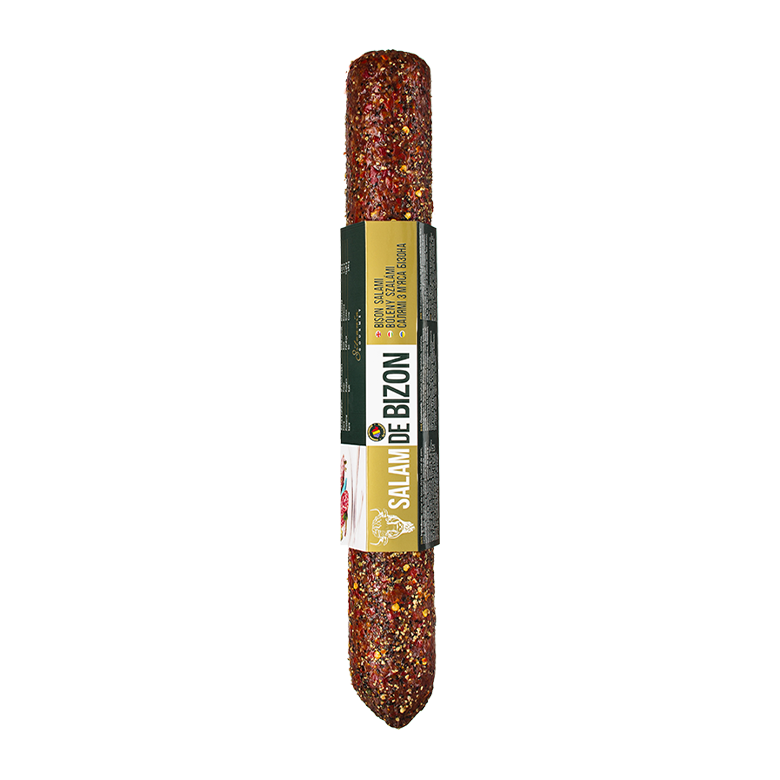 The provocative taste of the bison salami trimmed with a pepper and red paprika crust makes this a solemn specialty that brings une touche d'élégance to each meal. 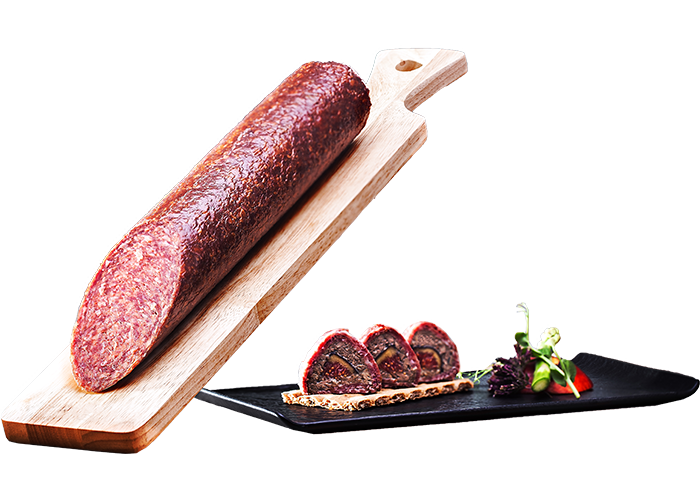 bison meat (51%), pork, bacon, beef, salt, sugars, spice extracts, natural spices, flavors, starter culture, preservative (sodium nitrite).Incrustion: pork gelatin and spices: dehydrated paprika, black pepper, green pepper, white pepper. Out of the hunting tales, we learned to prepare this irresistible specialty. 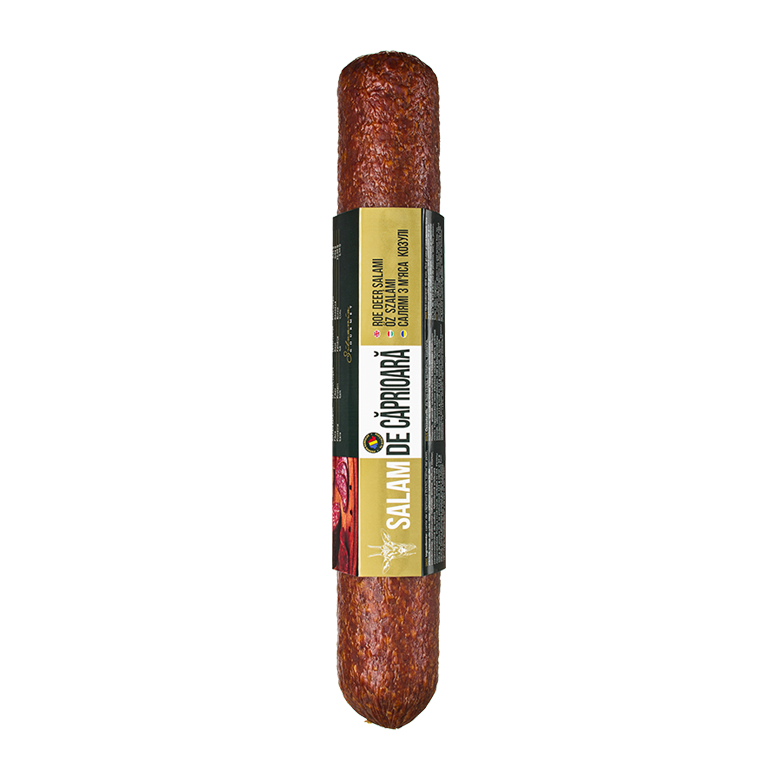 The deer salami relishes in an imposing taste that deserves to be served accordingly: with appetite. 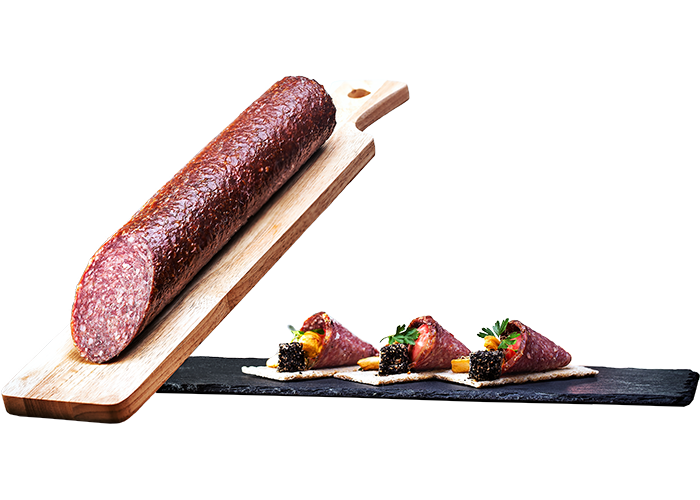 roe deer meat (51%), pork, bacon, beef, salt, sugars (maltodextrin, dextrose), spice extracts, natural spices, flavors, starter culture, preservative (sodium nitrite). In the kitchen, the care for details is the most precious asset. 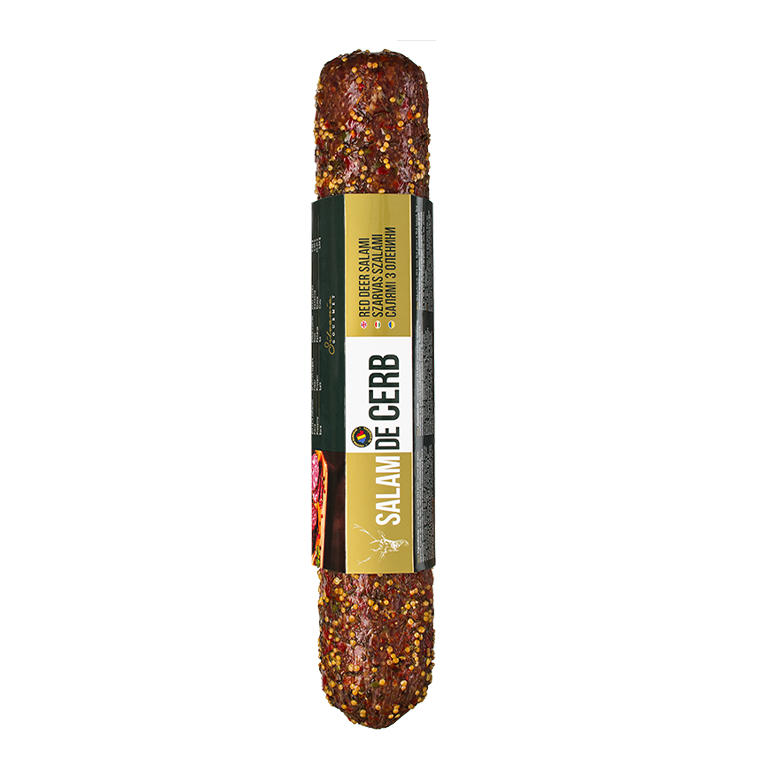 Surprise your guests with a red deer salami made with care, mustard seeds, pepper, paprika, and thyme. All is served with a glass of ruby wine and good humor. 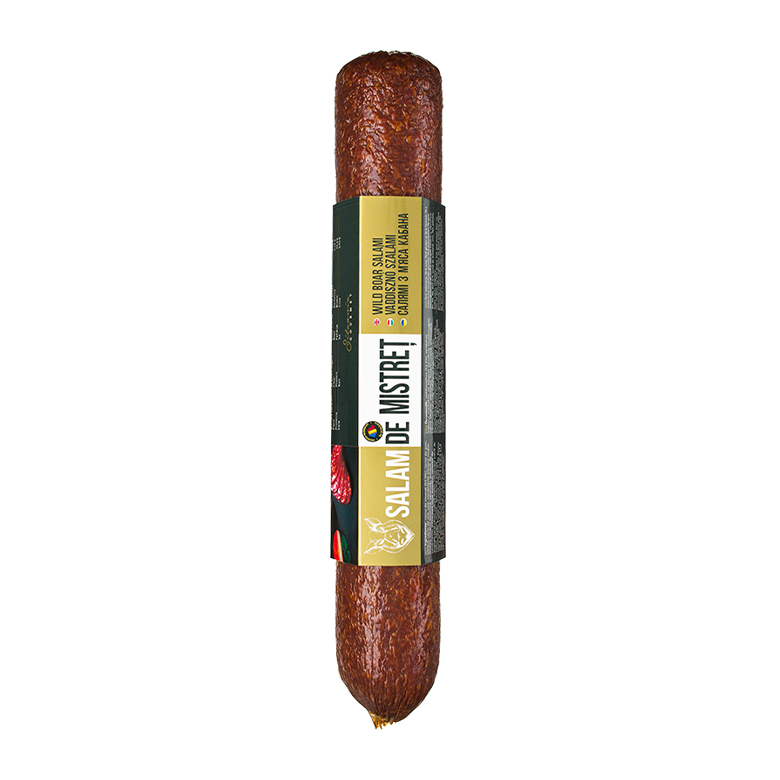 red deer meat (51.6%), pork, bacon, beef, salt, sugars (maltodextrin, dextrose), spices, starter culture, preservative (sodium nitrite). Coat: pork gelatin and spices, mustard seeds, dried pepper, caraway. Allergens: mustard. 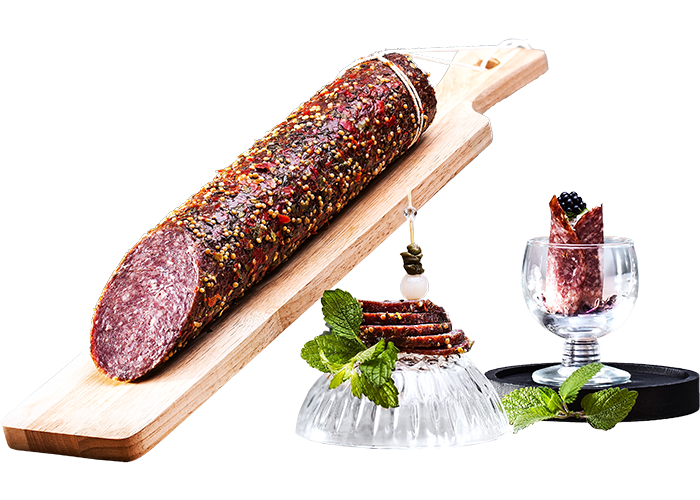 For those that enjoy a spicy thrill, the wild boar salami will surely find its place on the festive platters. Honor it rightly, with a noble wine to match. 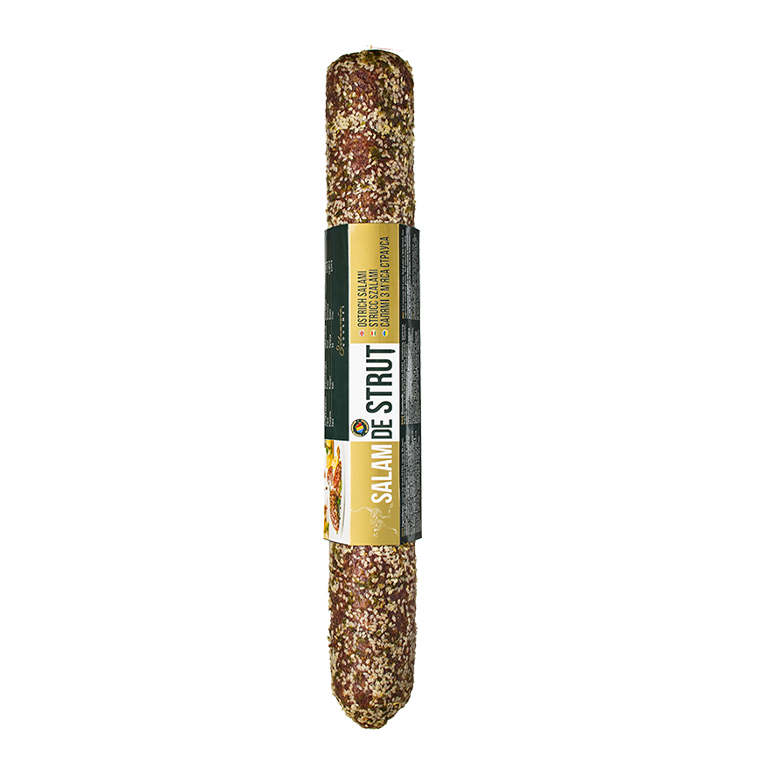 The sesame crust masterfully completes the ostrich meat flavor, making it become an irresistible temptation. ostrich meat (51%), pork, bacon, beef, salt, sugars (maltodextrins, dextrose), spices, flavors, natural flavor, starter culture, preservative (sodium nitrite). Coat: pork gelatin and spices: sesame, dehydrated red pepper, coriander. Allergens: sesame.